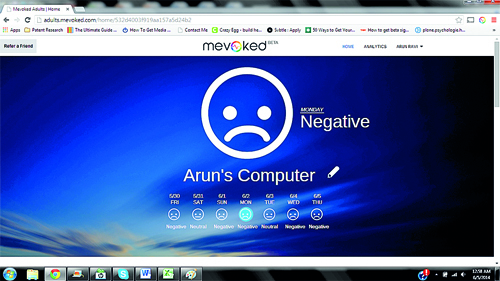 The tragic suicide of a friend when he was 13 years old inspired Arun Ravi to develop Mevoked. He remembers his friend’s parents wishing they had only known of the despair their son was feeling. Decades in the making, Arun’s new app is an answer to them. When you install it – a basic version is free of cost – it summarizes data from sources like URLs, web searches, Twitter and Facebook in real time. Mevoked gauges your child’s mood based on their online activity. “We then focus on content that is either violent, sexual, drug or mental health related,” Arun tells the Sunday Times in an email. Parents can contribute with observational data so that they are “aware of what’s going on and can intervene before any serious situation arises.”Like all technology, the app has its pros and cons (for instance, it’s easy enough for a clever teenager to circumvent). Families will need to discover what works and what doesn’t – for the most part on their own. Welcome to the age of digital parenting. In a time when a 10-year-old can teach his/her parent a thing or two about navigating the web and how social media works, parenting has become that much more challenging. Even a passing reference to banning Facebook can kick up a storm of protest. When President Mahinda Rajapaksa said on Twitter (he has 33,000+ followers on the site) that such an attempt would trigger a rebellion in his own family, he laid the concerns of many to rest. Still, the question has remained: should we be preparing our populace more carefully for a world whose borders now stretch far into the digital realm? Acknowledging the government’s inability to effectively police the entire internet, he added: “The digital jungle is not a regulated area, we all need to recognize that. The only way out is to engage.” Still, it’s the thought of such engagement that is giving some parents sleepless nights. In the wake of hysterical headlines that blamed Facebook for the suicides of two young girls, anecdotal evidence suggests some families are keeping their children offline. For the youngest panellists speaking at the event, that’s far from an ideal solution. For Megara Tegal, a journalist, and Udara Dharmasena, a coordinator of Mobile4D Projects at Sarvodaya Fusion, the advantages of being online and active are worth considering. Ease of access to information, the ability to publish their opinions and articles without waiting on mainstream media and the ever expanding networks that sustain them personally and professionally are only some of the advantages. “I like the community there, it’s really grown,” says Udara, speaking of a group that comes not just from every corner of the island but across the world. “It’s a new window for me.” For Megara, “getting information when it happens, as it happens,” is an indispensable advantage in her line of work. 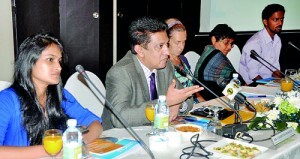 Speakers at the roundtable discussion. In essence, misogyny, child abuse and bullying exist offline, why wouldn’t they exist online? And considering that, is media being wilfully irresponsible when it identifies platforms like Facebook as being the threat? Is part of the problem that some parents just aren’t media savvy enough to make the distinction? One possible solution is to design campaigns on social media itself that help children understand the workings of the medium. “I think the internet itself should be used as a tool to raise this kind of awareness. Youth-friendly videos in different local languages, cartoons etc. could be used to raise awareness. Furthermore, privacy controls and using social media safely should be taught in schools,” says Senel Wanniarachchi, one of the speakers on a subsequent panel. In the end, it’s clear that while there are answers, none of them come easy. The web continues to hold up a mirror to our society, and the patterns we see only become increasingly intricate and complex as more and more of us get connected. In many ways, our children are on the exhilarating, chaotic frontlines; grappling with and shaping the constantly mutating forms of these new technologies. Any attempt to arm them has to be about more than just promoting ‘digital media literacy,’ though that is key. To keep them safe we need to build a space more respectful, more forgiving, and as Nalaka puts it, to “evolve more tolerant and pluralistic ways of engagement.” The cynical may debate the likelihood of this happening but as far as ambitions go it’s one that will serve us equally well, both online and off. Published in The Sunday Times, Sri Lanka on 8 June 2014. Words by Smriti Daniel. Pix courtesy Arun Ravi and Ranjith Perera.